I've been in the market for a new cutting board for some time now, so when Boos brand agreed to send me a board of my choice I jumped on the opportunity. I love the quality of their cutting boards and with so many styles and shapes to choose from you can never have too many! We do a lot of grilling/smoking so the BBQ board seemed to be a great option. This particular board is a heavy two-sided maple board that has juice grooves on one of the sides. It's perfect for carving a succulent roast and beautiful enough to be used as serving board for your grilled food. After a month of using this board, I can honestly say that I am as impressed as I thought I would be with it. I also love that the deluxe board comes with a very nice carving knife and fork. Boos makes quality boards that, in my opinion, can't be beat. To showcase this fabulous board I borrowed a recipe from Steve Raichlen for Bourbon-Brined Smoke Turkey Legs With Apple BBQ Sauce. You’ll also need: 1 large container or a jumbo or 2 large resealable plastic bags for brining. About 2 cups wood chips or chunks (apple or pecan work great), soaked for 1 hour in water to cover, then drained. 1) Make the brine: Combine the bourbon, salt, brown sugar, lemon, garlic, peppercorns, and mustard and coriander seeds in a large nonreactive bowl with 8 cups of water and whisk until the salt and brown sugar dissolve. 2) Rinse the turkey legs under cold running water. Put the legs into the resealable plastic bag(s) and add the brine. Refrigerate for 6 to 8 hours, turning periodically to distribute the brine evenly. 3) Set up the grill for indirect grilling and preheat to medium, about 325 degrees F. If using a gas grill, place half the wood chips or chunks in the smoker box or in a smoker pouch and run the grill on high until you see smoke. Then lower the heat. If using a charcoal grill, place a large drip pan in the center, preheat it to medium, then toss half of the wood chips or chunks on the coals. 4) When ready to cook, drain the brine off the turkey legs and blot dry with paper towels. Discard the brine. Lightly rub the turkey legs with the olive oil. Arrange the turkey legs in the center of the hot grate, over the drip pan and away from the heat. Cover the grill and indirect grill the turkey until cooked through, 1 to 1-1/2 hours, adding charcoal as needed To test for doneness, use an instant-read meat thermometer; the internal temperature should be about 165 degrees F.
Note: you can also smoke the turkey in a smoker. You’ll need 2-1/2 to 3 hours at 250 degrees. Place the ketchup, apple juice, molasses, cider vinegar, brown sugar, granulated sugar, red pepper, cinnamon, cloves, and celery seed in a large heavy nonreactive saucepan and gradually bring to a boil over medium heat, whisking to mix. Reduce the heat to low and let the sauce simmer until thick and richly flavored, about 40 minutes, whisking it often. When it’s properly cooked down, you’ll have about 2-1/2 cups. Season the sauce with salt and black pepper to taste; it should be highly seasoned. The sauce can be refrigerated, covered, for several weeks. Let it return to room temperature before using. What a beautiful board and the turkey legs sound great! Brining turkey makes all of the difference in the world. We've several brining recipes but none with bourbon -- thanks for sharing. Awesome giveaway! I've always wanted one of these wooden carving boards. Great recipe too! Love this recipe! Will definitely be on the menu when the BBQ season starts. And that board!!! So beautiful!! That is definitely a beautiful board...but I'm dying to try those turkey legs - the brine sounds amazing, plus I love anything smoked. That board is beautiful! I have had my eye on a walnut Boos Board for a while. That brine sounds delicious too! That bourbon brine sounds so tempting right now! I love Boos Boards and and thrilled to see others love them too. Entered the giveaway! Smoked turkey is always a favourite at our house. Love the fact that this version is both bourbon-brined and paired with apple... two of my very favourite flavours. Apple bbq sounds like a great idea! Lovely board. I love Boos Boards! And these turkey legs look perfect! Fingers crossed. I'd love to win that cutting board. 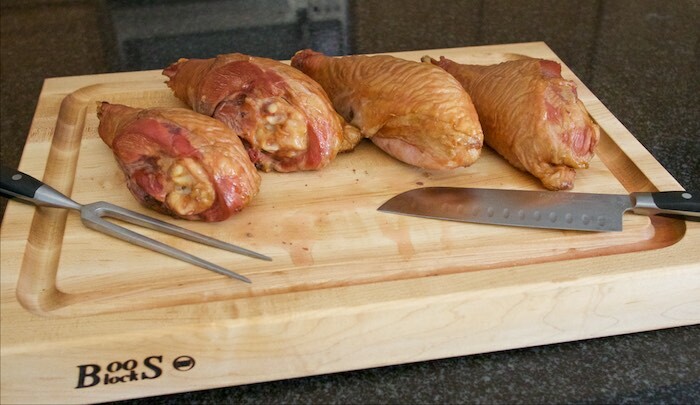 The Boos Boards are terrific and your bourbon brined smoked turkey legs sound awesome, they are a perfect match. That brine sounds delicious! I bet the bourbon adds wonderful flavor - though, at the same time, thanks for giving an alternative for those of us who need to avoid it. Thanks for the giveaway! I love these boards. And your turkey recipe sounds amazing! I'll be saving this for later! Wow that turkey sounds absolutely delicious, definitely keeping a hold of this recipe to give this a go asap. Gorgeous chopping board too, the juice grooves would definitely be useful to have. What a delicious meal and the board looks perfect! This apple BBQ sauce totally caught my attention - I bet it tastes incredible! Can't wait to try it! Your turkey legs look incredible! I have never tried brining...thanks for the inspiration! Hubby loves smoking meats and this turkey looks divine!! I'd love one leg in each hand and just go to town on them. I really want to win this board! Your recipe looks divine! I love that chopping board! I think a nice thick sturdy board is a necessity in every kitchen. Gorgeous recipe too! Those turkey legs look delightful. And the cutting board is gorgeous. I need a good, sturdy board like that! Looks delish, I should try! A fantastic recipe! I am pinning that Apple BBQ sauce. Yum!! I also love a good cutting board. I want to get my hands on this one! What a gorgeous board! I really need some new cutting boards. Especially ones as stylish as this! As for the turkey, it looks fabulous. My husband would love this with the bourbon brine! Not a meat eater but looks perfect for my hubby. Bourbon is what he loves so this is perfect. You can NEVER have too many quality cutting boards, I use 2-3 a day! This is a great recipe for smoked turkey!! Would love to win that cutting board!